It may surprise readers of this review when I reveal that this is my favourite Bob Dylan live album. For pretty much everyone else, it would seem to be the exact opposite! 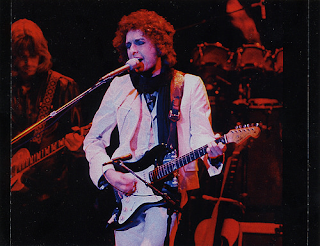 It was recorded during Dylan's tour to Japan in 1978, where, to please the Japanese audience, he agreed to play quite a few of his "greatest hits". Also, he assembled a large band that interpreted the material in a light, commercial, almost singalong way. There was lots of melodious flute and Phil Spector session veteran Steve Douglas provided some magnificent saxophone, both of those things are to my taste, particularly the saxophone. The way the material is played appals many Dylan aficionados, despising its "crowd-pleasing" nuances. Many prefer the muffled, scratchy intense sound of "Hard Rain", an album I personally cannot warm to at all. I do like the "Rolling Thunder" live material from 1976, however, and, of course, "Before The Flood". Despite the excellence of those two, I still prefer this one. Yes, I know, I know. Highlights for me are many - a delicious "Love Minus Zero/No Limits", a mysterious "One More Cup Of Coffee", "Is Your Love In Vain", "Going, Going, Gone", a version of "I Want You" that is actually close to that done by Bruce Springsteen in 1975, and fantastic versions of "Blowin' In The Wind", "Knockin' On Heaven's Door" and a tear-jerking "Forever Young" to end. 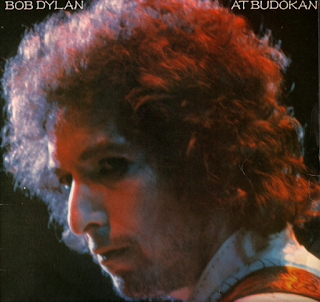 The latter is the best version of the song I have heard Dylan do - clearly enunciated, emotional and just beautiful. One of his finest live performances. "The Times They Are A Changin'" is great too. Personally, I love hearing Dylan so keen to please. Give this a listen and give it a bit of a reassessment.